Thinking about taking out a loan to make home improvements, buy a vehicle? You should take steps to protect you and your family in case something unforeseen happens. which could leave your family responsible for your loan balance. Riverfront's Debt Protection is a voluntary loan-payment protection product designed to help you get relief from loan payments if a protected life event unexpectedly happens to you. Contact us today and ask about protecting your loans. Call 610-374-8351, Option 4 or 5. Disclosure: Your purchase of Debt Protection is optional and will not affect your application for credit or the terms of any credit agreement required to obtain a loan. Certain eligibility requirements, conditions, and exclusions may apply. 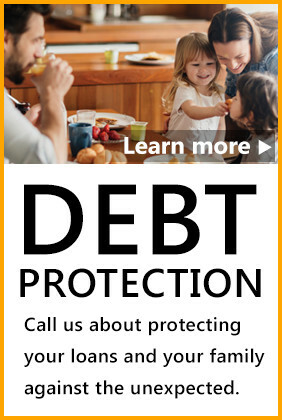 Please contact your loan representative, or refer to the Member Agreement for a full explanation of the terms of the Debt Protection program. You may cancel the protection at any time. If you cancel protection within 30 days you will receive a full refund of any fee paid.